Don Davis is an agent with Military Intelligence. Usually when someone is so identified, that person works for one of the branches of service, be it Army or Navy. In the case of Don Davis, he does not seem to care exactly which one he works for as sometimes he reports to Army Intelligence and other times it is Naval Intelligence that calls him in. He is so versatile, in fact, that at the beginning of his recorded adventures, he resigns his post with the U.S. government and heads to Europe to help in their war efforts (that did not last long, though, as he is soon requested back home). From then on he seems to float between bureaus with him reporting to the Navy for one mission and then the Army for another, then on to just the War Department and finally for a while he gets his orders from the F.B.I. He even gets called in by the Secret Service for a mission and towards the end of his recorded missions, the State Department makes use of his talents. His last mission has him reporting the his boss at 'Espionage Service Headquarters'. Who exactly he works for is never specified. Davis is shown to be a very fit man in his late 20s or early 30s. He has wavy brown hair and a strong chin. He is fond of smoking a pipe and many a briefing is displayed with him puffing away. In at least one adventure he is described by would-be kidnappers as being "strong as a bull" which might be true because it took three bad guys to subdue him. He is quick to action and prone to pounding people on the jaw to get their attention. He is also very susceptible to being hit on the back of the head as it happens an impressive number of times. We get no insight in all the many stories there are about him into his history or his personal life. At the beginning, he is referenced as being a lieutenant (almost certainly Army) but that title is not used again after he returns from England. Since he is never shown in uniform unless he is undercover, it is likely he is a civil servant for most of his missions. As to his activities outside of work, we learn nothing whatsoever. We know he is always immaculately dressed in suit and tie (but then so are the bad guys usually) and we know that he can catch the eye of the occasional woman but he seems much to busy to be interested (except for that young lady in Warsaw!). One mildly interesting quirk of Davis is his introducing himself as "Davis of the Intelligence" - the use of the definite article "the" seems oddly out of place but the rest of his manner of speech, taciturn though it is, is normal. 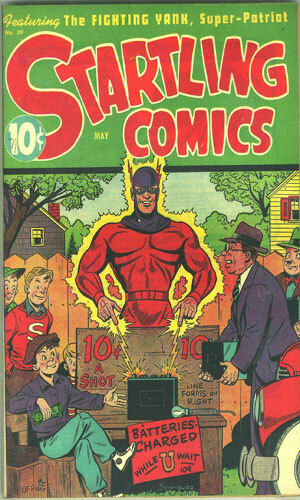 Published from June 1940 to September 1948 with 53 total issues numbered 1-53, Startling Comics was a production by Better Publications, also known as Nedor Publications, Standard Publications, and Pines Publications, which was started by Ned Pines who ran these several companies from 1928 until 1955 when he closed them down to concentrate on Popular Library, a paperback publisher. 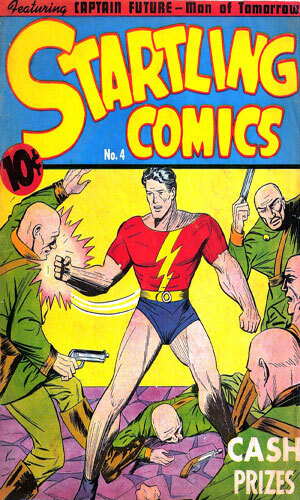 Don Davis showed up in the second issue, along with headliner Captain Future (he crossed gamma rays with the infra-red to gain great powers) as well as Mystico (brought back from ancient Egypt to fight crime), G-Man Dalton (Fed extraordinaire), Scoop Langdon (ace reporter), Biff Powers (big game hunter), The Masked Rider (western fare), Detective-Sergeant Burke (police detective), and Happy and Snappy (comedy hijinks). There were also two short stories by Donald Bayne Hobart, one about the Wild West and the other a modern-day crime piece. 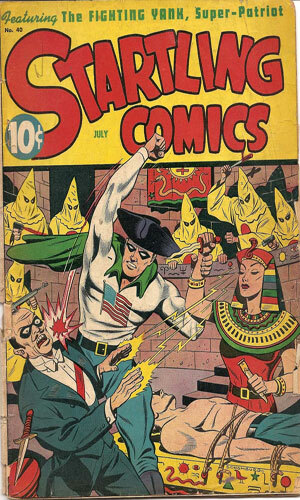 Don Davis was a near-constant member of this publication throughout its run. It is possible that I missed some adventures because my digital copies of the comics might not have contained every page but other sources indicate this is the lot. 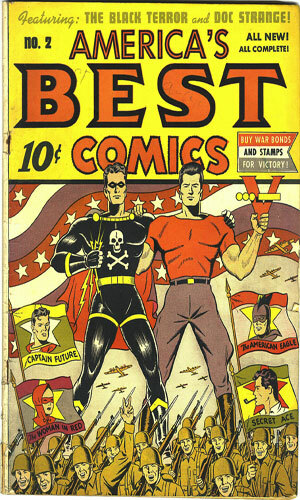 America's Best Comics in its short run had two issues with a Don Davis adventure and The Fighting Yank had one issue with Don Davis making an appearance. Most of the stories were 6 pages long with a few being given 7 pages and a couple limited to 5. One adventure near the end (Sep 1945) was an impressive 9 pages in length. As mentioned above, there might an issue or two missed however it seems pretty clear that the last one was the Nov 1947 adventure. Each preceding adventure ended with a promo for the next one except that one which concluded with a simple "The End". Note: Each adventure except the last was without a title so I have provided my own, in quotes. 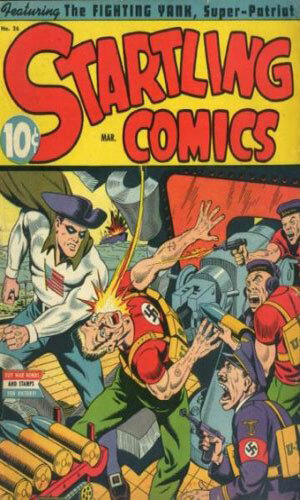 Startling Comics #2 - Don Davis is assigned the job of finding and stopping saboteurs destroying American factories. Startling Comics #3 - The British ask Don Davis for help when several of their own agents are intercepted by spies and killed. 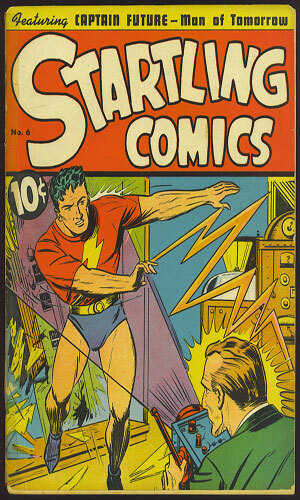 Startling Comics #4 - Don Davis resigns his commission to go work for British Intelligence. His first mission is in the Middle East stopping Nazi-backed Arab raids on a pipeline. 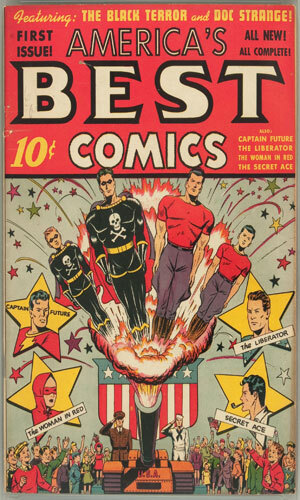 Startling Comics #5 - Fifth columnists are killing top military men. To stop them, Military Intelligence calls overseas for Don Davis to come back and root out the bad guys. 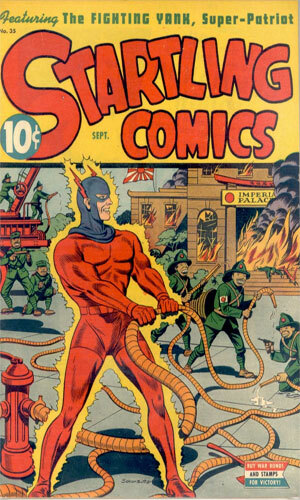 Startling Comics #6 - Numerous factories have been sabotaged and one common aspect was the charred remains of a secretary who had worked overtime. Don Davis is sent to stop the mayhem. 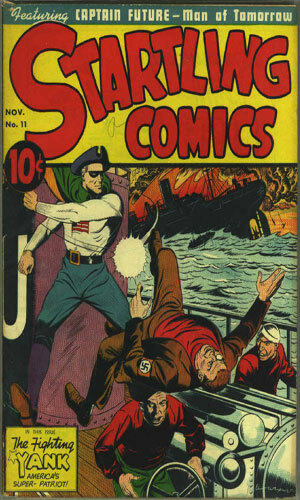 Startling Comics #7 - Germans are smuggling agents into the US by hijacking ships at sea and replacing the crew with their own men. Don Davis's investigation would have ended with his death except for a female British agent. 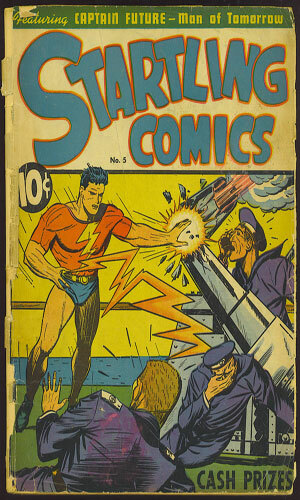 Startling Comics #8 - Panama Canal fortification plans have been stolen and it is up to Don Davis to get them back. Startling Comics #9 - The murder of a visiting professor gets Don Davis sent to look into multiple homicides all related to a spy ring. 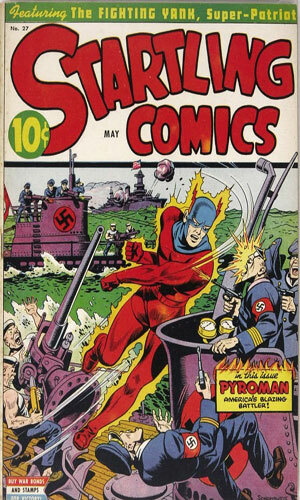 Startling Comics #11 - New fortifications in Puerto Rico are being slowed by Nazi saboteurs coming in by submarine. 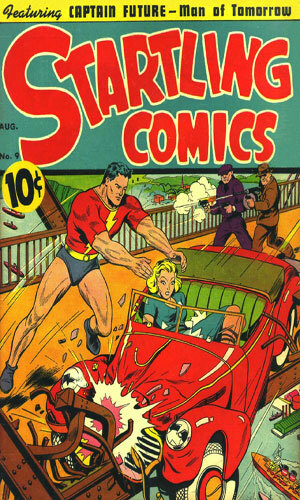 Startling Comics #12 - An envoy carrying British cargo ship locations is snatched by enemy agents before Don Davis can get to him. Now Davis is determined to find him. 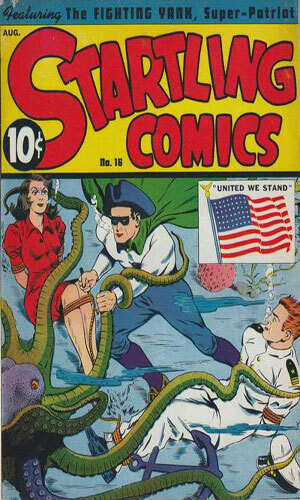 Startling Comics #13 - Down in Rio, American naval plans are being stolen and Don Davis is sent there to stop the leak. America's Best Comics #1 - American cargo ships are disappearing and Don Davis is asked to see what is happening with them. He does so by becoming the second mate on the next vessel leaving. 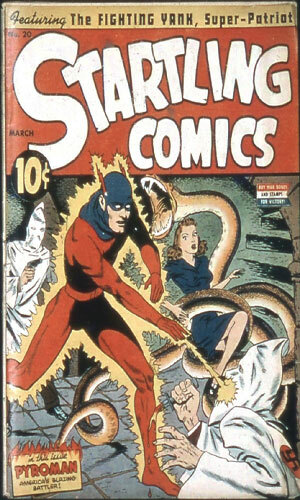 Startling Comics #14 - A scientist friend of Don Davis is thought to have committed suicide but Davis is certain it was murder to steal his latest gas experiments. 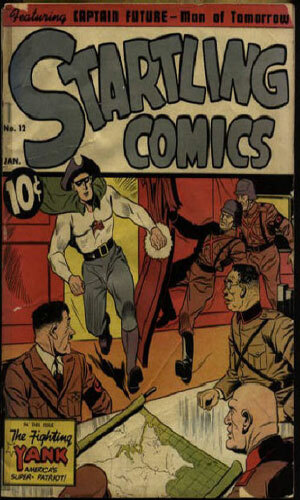 Startling Comics #15 - A military attaché returning from Russia is being met by Don Davis for protection but he is also being met by enemy agents wanting to grab him. 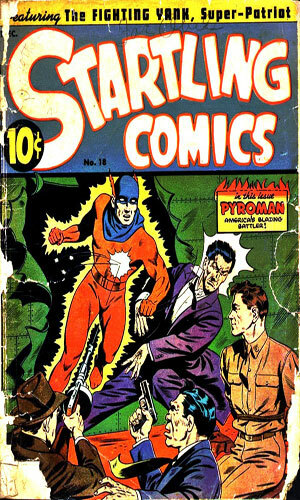 Startling Comics #16 - A scientist developing a new turbosupercharger (sic) is being sought by enemy agents who grab his son as bait. Don Davis is sent to set things right. America's Best Comics #2 - Hand-delivering a map to a remote site, Don Davis comes upon enemy agents scoping out the area for a future invasion. 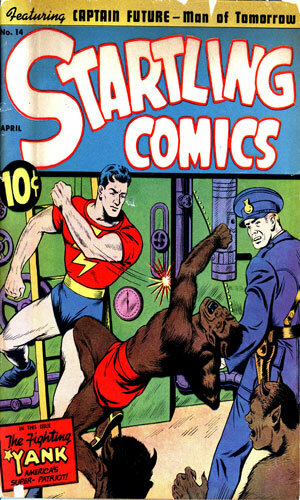 Startling Comics #17 - A man stealing plans from the War Department is being investigated by Don Davis. He is also being hunted by his own men to keep him from talking. 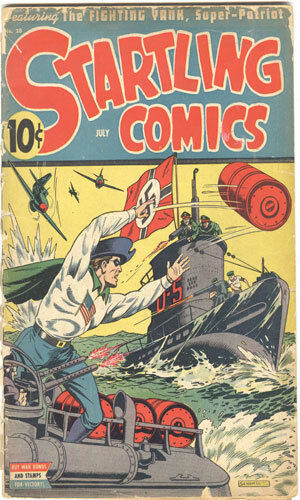 Startling Comics #19 - U-boats have been attacking Canadian ships in the Gulf of St. Lawrence and Don Davis is sent up North to lend a hand. 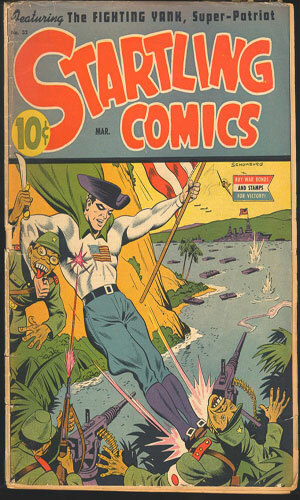 Startling Comics #20 - A rat in the San Francisco Naval Yard is selling departure info to enemy submarine commanders who then sink the supply ships. Don Davis is on the job. 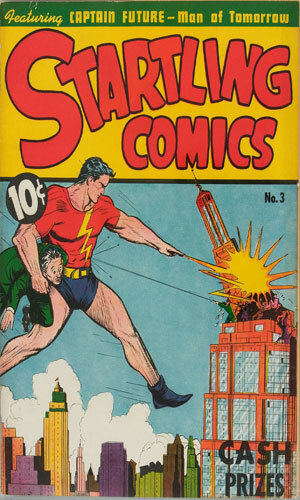 Startling Comics #21 - The F.B.I. calls in Don Davis to find a gang of bank robbers. He gets in trouble but is able to call for help using a train's whistle to signal Morse code. 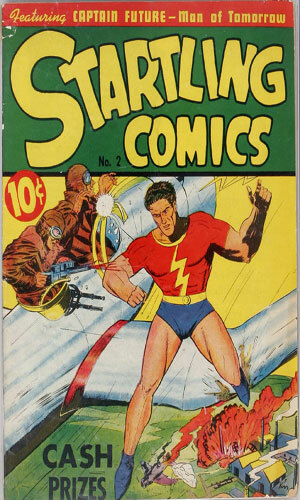 Startling Comics #25 - Don Davis is asked by a British friend to head to Egypt to find a missing engineer of a secret air base project. 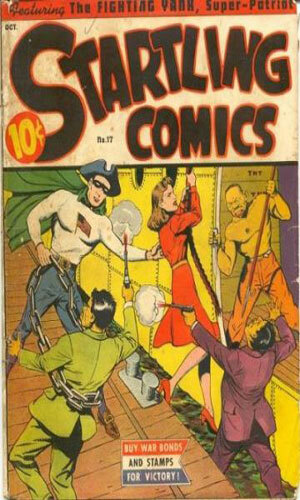 Startling Comics #26 - Sent to the dock to meet an arriving British agent, Don Davis witnesses an altercation. Stepping in he may have aided the wrong side and must now right things. 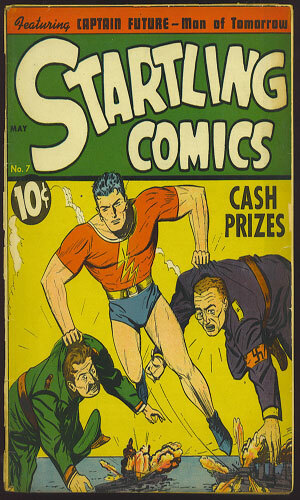 Startling Comics #27 - A deep-cover agent left vital secret documents in Warsaw after the war started. Don Davis must parachute into Poland to find and get them without getting snatched by the Germans. 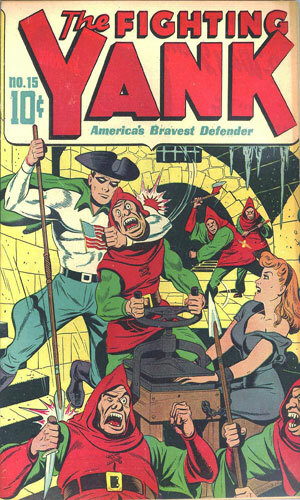 Fighting Yank #8 - In Don Davis's first foray against Japanese agents, he heads to the west coast of Mexico where oil refineries are being sabotaged. Startling Comics #28 - Don Davis takes several weeks out of his busy schedule to sail to Ceylon to learn about his uncle's death. People there do not like his presence, especially Japanese soldiers. 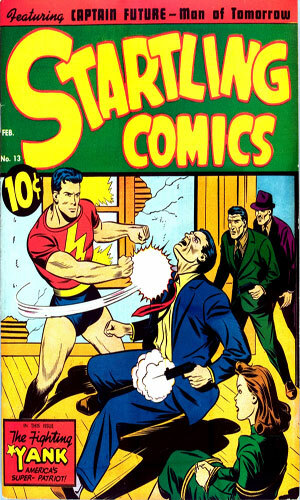 Startling Comics #32 - A notorious secret agent named Brigham Lombardy, alias 'The Eye', is in the San Francisco area and the U.S. Secret Service asks Don Davis to track him down. 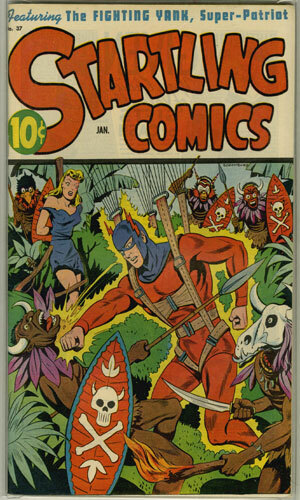 Startling Comics #33 - The enemy agent known as 'The Snake" "uses a charity drive to cover a nation-wide poison plot". Don Davis is out to stop him and get justice for two murdered Air Force officers. 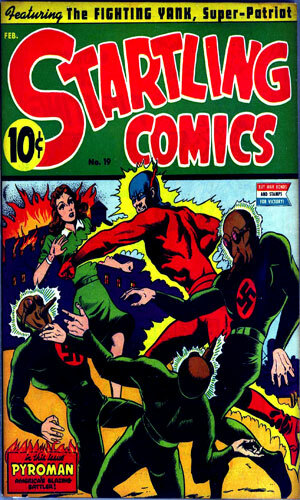 Startling Comics #35 - Though Germany has lost the War, sleeper agents in the US are determined to continue to sabotage things, this time via counterfeit money. The F.B.I. calls in Don Davis. 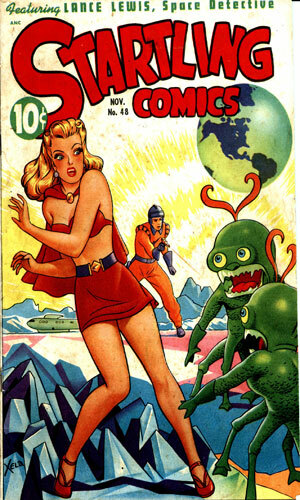 Startling Comics #37 - Don Davis is assigned to protect a beautiful Indo-Chinese secret agent named Torin, a woman who definitely does not need much help surviving. 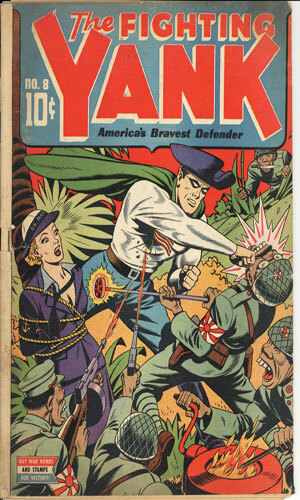 Fighting Yank #15 - The British have sent a low-level agent to carry home from the US some vital plans for a new long-range flying bomb, all in the hope of throwing off Nazi agents. It is not working and Don Davis must step in to help. 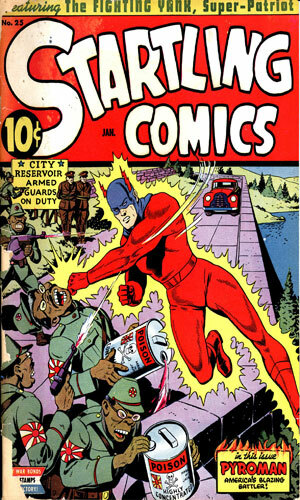 Startling Comics #39 - The capital of the Central American country of Mantegala is the site of insurgents trying to destroy democracy in the small nation. Don Davis is sent by the State Department to lend a hand to the government. 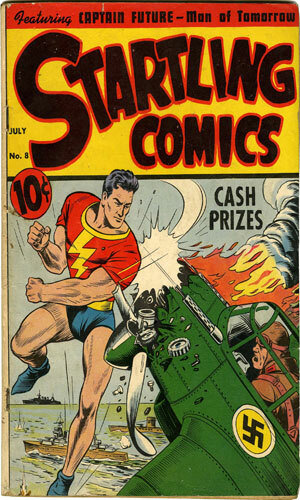 Startling Comics #40 - In an apparent flashback story to the end of the War with Japan, Don Davis is asked, as a 'crack F.B.I. operative' to fly from the Philippines into Japan to get a chart of big-gun emplacements along the Japanese coast. 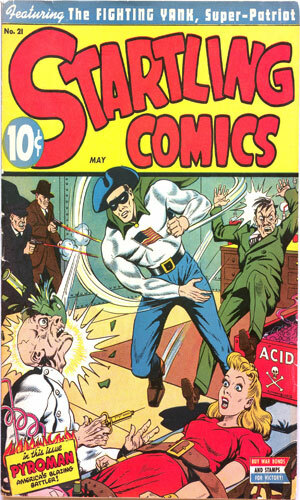 Startling Comics #48 - A well-known international smuggler is casing the Espionage Service Department headquarters but when he is talked with, he shows works for the Hodomalan Republic. Smelling something fishy, Don Davis looks into it. Many writers develop a pattern to storytelling; in romance novels it is often boy-meets-girl, boy-get-girl, boy-loses-girl, boy-gets-girl-back, the-end. In spy thrillers there are several different repeat sequences like op-tracks-villain, op-loses-villain, op-track-villain, op-captures-villain. Another one that habitually annoys me is op-tracks-villain, op-gets-captured, op-gets-away, op-gets-recaptured, op-gets-away, op-captures-villain. For the Don Davis stories, regardless of for whom he is working that particular mission, it is Davis-gets-to-scene, Davis-slugs-someone, Davis-gets-knocked-out, Davis-gets-up, Davis-shoots-villain, Davis-wins. Just about every one of the 30+ adventures goes like that. Locales vary as do who is being sought but ol' Don is gonna slug somebody and somebody else is gonna bean him with a chair, sure as little green apples. Back then they never talked about concussions and the relatively new buzz term I hear watching football, chronic traumatic encephalopathy. If they had mentioned it, Davis would have been the poster child.